At the beginning of June, the very nature of Canadian citizenship was altered as a major portion of Bill C-24 went into effect, officially creating a two-tier citizenship system. As a result of this new law, dual citizens and people who have immigrated to Canada can have their citizenship taken away while other Canadians cannot. 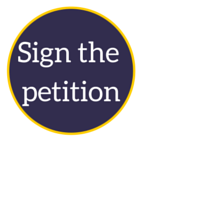 The response to the implementation of Bill C-24 has been amazing; in the past few weeks since the new provisions came into effect, 50,000 Canadians have signed our petition to repeal the citizenship changes, bringing the number of signatories to almost 95,000! It’s clear that people really care about this issue, and we’ve received thousands of comments and questions about what the new provisions mean and how they will affect Canadians. We’ve put together this list of frequently asked questions to help. Click on the questions below to skip down to the relevant information. Update: We kept being asked, so we’ve added a tenth answer, regarding whether Bill C-24 applies to Canadians retroactively (see number 6). Who will be affected by the changes to Canadian citizenship? Why will this turn dual citizens into ‘second class’ citizens? Why does the law only apply to dual citizens and those people who are eligible to obtain another citizenship? Does this really apply to Canadians who don’t have another citizenship, but could be eligible for another citizenship? What about new or naturalized Canadians who end up living outside Canada? Does Bill C-24 apply only to those who become Canadian after it comes into effect, or does it apply retroactively to all those who are dual or eligible to be dual citizens? If I don’t break the law, this won’t affect me, right? What are the next steps/what can we do? Can you give me advice about my specific case? I want more detailed information! 1. Who will be affected by the changes to Canadian citizenship? Anyone who holds or is eligible for another citizenship could be vulnerable to the citizenship stripping provisions of Bill C-24 if they commit the offences or prohibited conduct referred to in the Bill. This legislation has the potential to capture lots of people, and once we allow for citizenship revocation for some, it won’t take much to further pry that door open wider in the future to allow revocation on additional grounds. We have the benefit of a modern judicial process that includes prosecution, trial before an independent judge and, in the event of conviction, a just punishment that achieves the goals of deterrence, retribution, denunciation and rehabilitation. We do not need to throw Canada back to the dark ages and revive the medieval practice of banishment as a way of punishing people. And once we make it lawful to exile some people, what’s to stop it being used against others in the future? Misinformation is being used to justify these changes; you can read a breakdown of these myths and inaccuracies here. 2. Why will this turn dual citizens into ‘second class’ citizens? This law says that some Canadians, who have no other citizenship and no eligibility for citizenship anywhere else, are Canadians forever. Other Canadians, including dual citizens – who have Canadian citizenship and the citizenship of another country at the same time – could possibly have their citizenship taken away, even if they were born in Canada. Even if the government never takes their citizenship away, the fact is that their citizenship is no longer secure and permanent. It’s been said that citizenship is “the right to have rights”. For those whose citizenship is now insecure, their rights as Canadians are also insecure. 3. Why does the law only apply to dual citizens and those people who are eligible to obtain another citizenship? Under international law, it’s illegal for a country to take someone’s citizenship away from them if that would leave them “stateless”, meaning that they have no citizenship – or access to citizenship – in any country. So Bill C-24’s citizenship revocation provisions apply to dual citizens, because taking their Canadian citizenship away would still leave them with another country of citizenship. Citizenship can only be revoked if you meet certain criteria in Bill C-24, like being convicted of one of the list of crimes that make citizenship stripping possible, or if you are suspected of one of the activities that make you eligible for citizenship stripping such as participating in armed conflict against Canada. Regardless, dual citizens now have weaker rights of citizenship simply because it is possible to take their citizenship away. 4. Does this really apply to Canadians who don’t have another citizenship, but could be eligible for another citizenship? Under international law, Canada can’t take away someone’s citizenship if it would leave them stateless, meaning that they have no citizenship – or access to citizenship – in any country. But Canadians, even those born in Canada, who are eligible to acquire the citizenship of another country could be vulnerable to C-24’s citizenship stripping provisions. They may never have set foot in the other country, or even be aware that they are eligible for citizenship in another country. However, they can be subject to citizenship stripping because it is arguable that they can obtain another citizenship. This is especially problematic because eligibility for another citizenship is not the same as having another citizenship. Just because you are eligible to apply does not mean that the other country will give it to you. But for the purpose of C-24, just being eligible for another citizenship is enough. So in fact, someone in this situation who had their Canadian citizenship stripped could wind up not having citizenship anywhere. 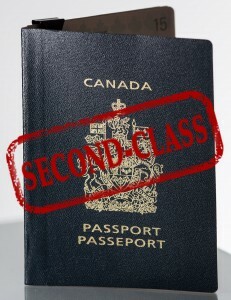 Citizenship can only be revoked if you meet certain criteria in Bill C-24, like being convicted of one of the list of crimes that make citizenship stripping possible, or if you are suspected of one of the activities that make you eligible for citizenship stripping such as participating in armed conflict against Canada. Regardless, Canadians who are eligible to obtain the citizenship of another country now have weaker rights of citizenship simply because it is possible to take their citizenship away. 5. What about new or naturalized Canadians who end up living outside Canada? The ‘intent to reside in Canada’ provisions would make new Canadians vulnerable to citizenship stripping if, after they become citizens, they move abroad for some reason. From now on, new Canadians will have to promise that they intend to reside in Canada as a pre-condition of obtaining citizenship, and failing to reside in Canada after citizenship is granted could mean that the government will consider you to have lied in your application for citizenship. Misrepresentation is a ground for nullifying citizenship. So a new Canadian who moves to another country to be with a dying relative, to live with their children, or to pursue a business, academic, or other employment opportunity could be at risk. 6. Does Bill C-24 apply only to those who become Canadian after it comes into effect, or does it apply retroactively to all those who are dual or eligible to be dual citizens? Most of Bill C-24 applies to everyone who holds or is eligible to hold dual citizenship, regardless of when they obtained their Canadian citizenship and even if they are born in Canada. However, the “intent to reside” provisions will apply only to those who become naturalized Canadian citizens after Bill C-24 went into effect. The government has always had the power to nullify someone’s citizenship if they can show it was obtained fraudulently. Bill C-24 requires new citizens to attest to the fact that they intend to reside in Canada as part of their application for citizenship. Accordingly, if you move away from Canada after getting citizenship, then it is at least possible that the government could claim that you lied on your citizenship application about intending to reside in Canada. We do not know how likely it is that the government would choose to do this in any given individual’s case. 7. If I don’t break the law, this won’t affect me, right? Citizenship stripping will only be triggered in a narrow range of circumstances. But regardless of your behaviour, if you are a dual citizen or a Canadian who is eligible for citizenship in another country, you now have weaker citizenship rights than other Canadians. Others have a permanent right of citizenship in Canada, no matter what. That is no longer true for you. 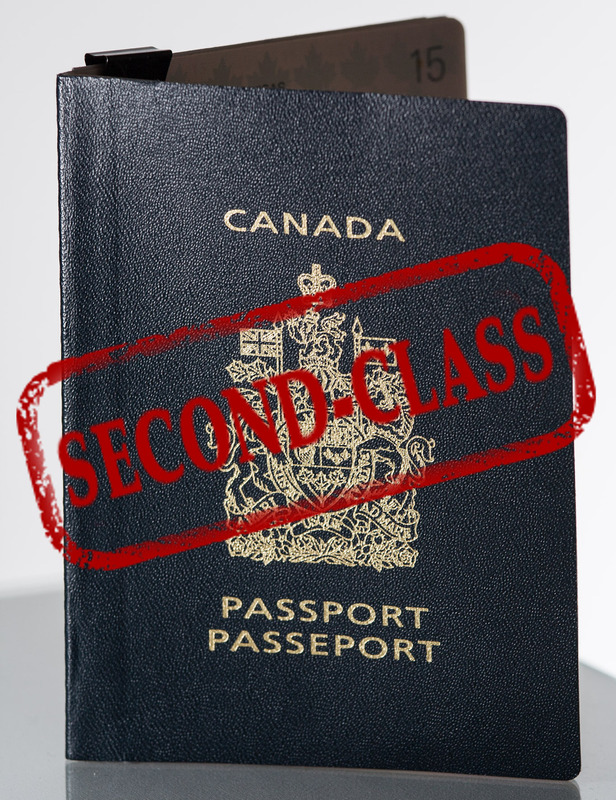 Even if the government never moves to take your citizenship away – and it won’t try to do this to most people – you have a second-class of Canadian citizenship that is not as strong as others. This changes what it means to be Canadian – it gives some of us different rights than others, just because of our background. In this way, C-24 affects us all. The new provisions allow officials to take away a person’s citizenship based on serious criminal convictions in Canada, such as terrorism offences. But it doesn’t stop there. Citizenship can also be stripped for criminal convictions for similar offences that occur outside of Canada, regardless whether the regime or judicial system under which the person was convicted is undemocratic or lacks the rule of law. So for example Bill C-24 could be used to strip the citizenship of a journalist who is convicted of a “terrorism offence” without a fair court process in another country, when their “crime” was actually reporting on human rights violations by the government. Legal experts have also warned that the list of offences that could lead to the removal of citizenship might be expanded in the future. Citizenship should not be a licence the government can revoke for misbehaviour. We take the position that a Canadian should be a Canadian, permanently. It is the role of the criminal justice system, not elected officials or bureaucrats in the citizenship ministry, to punish people for wrongdoing. Making some people vulnerable to revocation of their citizenship devalues the very meaning of Canadian citizenship, which is something we should all be concerned about. 8. What are the next steps/what can we do? When Bill C-24 was passed last year, we announced our intention to challenge this law in the courts, along with our ally the Canadian Association of Refugee Lawyers. Now that these provisions are in force, we are moving ahead. The BCCLA remains committed to challenging this new law, so be sure to sign up to our email list to receive updates on our progress with this court challenge. In the meantime, share the petition with your friends and family to let them know about this important issue. 9. Can you give me advice about my specific case? We cannot provide you with legal advice. You will need to speak with a lawyer in order to be certain about how the law will affect you personally, and to answer any questions about your current citizenship or immigration status. 10. I want more detailed information! Our allies at the Canadian Association of Refugee Lawyers (CARL) have put together this excellent one-page legal primer, which gets into some of the details of the new law. You can also find a post by CARL debunking some of the misinformation around this law on our website. If you want to really delve into the details, read CARL’s detailed legal analysis of Bill C-24, submitted to the Citizenship and Immigration Committee of the House of Commons. If you want to take a look at the full text of Bill C-24 itself, you can find it on Parliament’s website. * “Canadian Passport” by chealion used under CC BY / “Second Class” stamp added to original. Previous Post: All votes are equal, but some votes are more equal than others?